John Gibbons - Unique Crawling Starfish Sculpture in Amber with Deep Green Barnacles. 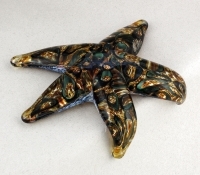 Perched on the edge of a table or shelf, starfish appears to be crawling back to the water. Size is approximately 1" high X 5 1/2" across. Most items are in stock and will ship within 24 hours.